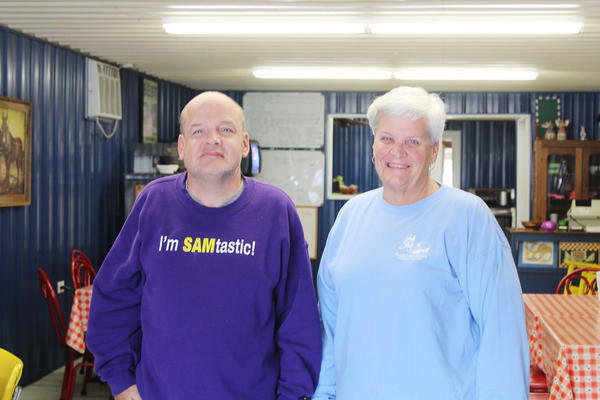 Paula’s Hot Biscuit is a family owned business that is located on 311 West Water Street in Hodgenville. The restaurant serves a special every day with several plate lunches that feature a wide variety of breakfast and lunch food items including bacon, eggs, pancakes, biscuits and gravy, soups, sausage, sandwiches, cakes, pies and more. Paula’s Hot Biscuit also caters to several different events including wedding receptions, birthday parties, anniversary parties and others. Paula’s Hot Biscuit is known throughout the community and state for their great food and service as well as their friendly hospitality. 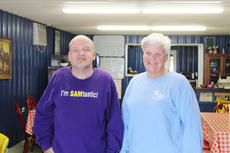 Pictured is owner Paula LaRue Varney with her son Sam Varney. Owner Paula LaRue Varney opened the restaurant in May 1997 after she closed the former Abe’s Market in Hodgenville. As far as marketing her business, Varney said that good food and service are key, but that making everyone feel like a friend is just as important. Varney said she has had several repeat customers throughout the years and that they have all made a lot of memories and also helped each other. The restaurant is also active in the community as they hold various fundraising events and other community events. They also host the weekly meeting of the Hodgenville Rotary Club each Thursday. After giving back to the community for so many years, Varney said that the community was there for them when the restaurant was closed for several weeks in July 2015 after it was flooded due to heavy rains. Varney went on to say that the restaurant would not be possible without her staff of Billie McIntyre, Dollie Neagle, Rose Meredith, Kim Rucker, Genoveva Calvillo and Varney’s son, Sam Varney. The hours for Paula’s Hot Biscuit are Tuesday, Wednesday and Friday from 5:30 a.m. to 2 p.m., Thursday from 5:30 a.m. to 10 a.m. and Saturday from 6 a.m. to 10:30 a.m. For more information call 270-358-2237.